I was relaxing in a waiting area recently, picked up a fishing magazine and found an interesting article. It was a bass fishing story written in a format that described the angler’s experiences during a day on the water by the time-of-day when notable events occurred. I enjoyed the article, had seen many written this way, but had never written one. Coincidentally I was planning my first late-fall fishing trip for largemouth bass and decided it would be a good time to write a similar story. So follow along as I plan and take my first trip of the cold-water period for largemouth bass, our most popular game fish. 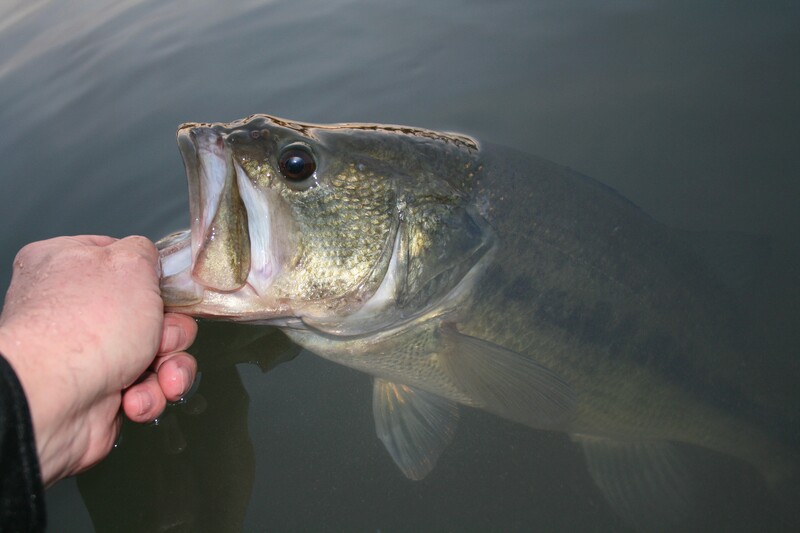 From late-fall through late-winter is my preferred time to fish for largemouth bass because fishing pressure on most waters is very light and the absence of recreational boaters reduces disturbance of the fish further. There’s a range of temperatures this time of year in which schools of bass move to predictable, often easy to find, types of structure. As temperatures fall through the mid-50’s, many largemouths move to and hold on steep drop-offs along primary channels close to shallow water. The steeper the drop and the more structure associated with it, both shallow and deep, the better. After the fish move and settle, they are most active during stable or rising temperatures but seldom move far from the drop-off except to change depths as conditions change. Combine this setup with favorable weather and water conditions and largemouth fishing can be very good, after you find the fish. The body of water I chose to fish is a small river-run lake an hour away and one I frequently fish this time of year. The first thing I considered when I began planning my trip was water temperature. To estimate the water temperature on my distant planned fishing area I went to the two primary rivers that eventually feed the lake, both much closer to my home. The larger one flows from below a reservoir dam and the other is a smaller, free-flowing river. The larger river was surprising warm at 63.7 degrees and the smaller one was 48.4 degrees. Another check a mile or so below the confluence of the two confirmed the mixed water had stabilized around 56.5 degrees. I knew there were a few more small free-flowing streams joining the primary river further down, but upstream of my fishing area, so I estimated the water temperature there must be somewhere in the mid-50’s; ideal for late-fall fishing. My guess was correct because the water temperature where I started fishing was 55.2 degrees. I couldn’t have planned it better. When I arrived at the ramp, air temperature was in the low-50’s and rising with mostly sunny skies and light winds. The barometer was stable but projected to begin a gradual drop during the afternoon. I would not be fishing under the influence of a new or full moon but a daily lunar feeding period was going to begin about two o’clock, close to the time when surface water temperature would peak. So the weather and conditions were ideal for November largemouth bass fishing and I felt confident as I prepared to launch my boat. I had several rod and reel combos prepped and ready for cold-water action including a medium-heavy spinning outfit with a suspending minnow lure, another with a hollow-bodied shad swimbait, a flipping combo paired with an Alabama Rig, and a medium-heavy baitcasting combo with a jig and pig. I also packed a small voice recorder so I could capture the details of my day as they occurred. After a long run to a steep channel-edge I knew should hold some fish, I lowered my trolling motor, grabbed my jig-and-pig combo and eased onto the down-current end of a one-hundred-yard-long section where I had decided to start. Water depth in the channel ran from twenty- to more than twenty-three feet but in the distance of a long cast the bottom rose to three-feet-deep along the edge of a large shallow flat. After pinpointing the top of the break-line I moved back toward deep water and when I reached twenty-one feet, turned the boat and made my first cast at 12:40 p.m.
1:14 p.m. – The line twitched sharply from my first strike of the day, but the fish wasn’t there on the hook set; a small fish perhaps? 1:32 p.m. – Another strike I could see and feel, but again, a swing and a miss. Was it something I was doing wrong or were the fish simply not active enough to engulf the lure? I became intensely focused on the jig as I slowly worked it down the steep incline. 1:55 p.m. – I lifted a one-pound-class largemouth into the boat, my first of the day. The strike felt like the other two except this fish fully engulfed the lure. 1:57 p.m. – I set the hook hard and my rod bowed deeply. Soon a large head broke the surface, shaking a wide-open mouth as a big fish tried to throw my jig. After a brief but exciting battle, I slid my landing net under a very nice largemouth. Four pounds and thirteen ounces later, I noticed my hand trembling as I admired the big fish. This bass went in the livewell for a few pictures later. 2:06 p.m. – My line twitched sharply, I set the hook and soon had a good keeper fish thrashing the surface. This bass was well over a pound and beautifully marked. 2:13 p.m. – I lifted a half-pound fish into the boat, the smallest of the day so far but no less welcome. 2:15 p.m. – A good pound-and-a-half bass struck this time and a tricky one it was. I had lifted and dropped my jig a couple of times and watched the line closely each time the jig fell. Then on the next drop, the line went slack immediately. I lifted again, dropped and the line went slack again. I realized a fish had picked up my jig and was swimming toward me so I quickly reeled down, set the hook and the fish was there. This bass was a good fighter because it jumped several times and put on an impressive show. 3:15 p.m. – I landed and admired another keeper-size fish, much like others I’d caught. I decided to stop fishing and weigh this one because it was a good representative size and my frequency of strikes had diminished. It weighed exactly one pound. 3:30 p.m. – I moved away from the channel break, returned to where I had started fishing and began casting my Alabama Rig along the face of the drop-off. After fishing through the area without a strike, I decided to move to a different spot along a distant riprap shoreline that dropped into the river channel at similar depths. Action had been good so far and only one other boat had shown and moved close enough to exchange greetings. 4:20 p.m. – A half-pound fish finally took my jig and was soon in hand. Other than one other small fish that followed my lure to the boat and tried to eat the pork frog off my jig, I had no other strikes along the riprap shoreline. 4:35 p.m. – I moved back to the channel break where I had started fishing for one more pass before quitting. 4:46 p.m. – A good pound–plus largemouth knocked the slack from my line and was soon in hand. I had one other light tap on the next cast but there was nothing there on the hook set. 5:00 p.m. – The sun was crowding the horizon so I quit fishing, stowed my equipment and moved to an adjoining shoreline to take a few photographs. 5:20 p.m. – The sun has set, my boat’s on the trailer and I’m ready to start for home. I recorded eight bass caught in a little more than four hours with the largest pushing five pounds; a good day of fishing and start to the new season. I enjoyed my first trip in many months to fish for largemouth bass and considered the outcome successful. The bass were grouped on traditional cold-water structure and responded well to the same lures and methods of presentation I’ve employed for many years to catch these fish under similar conditions. 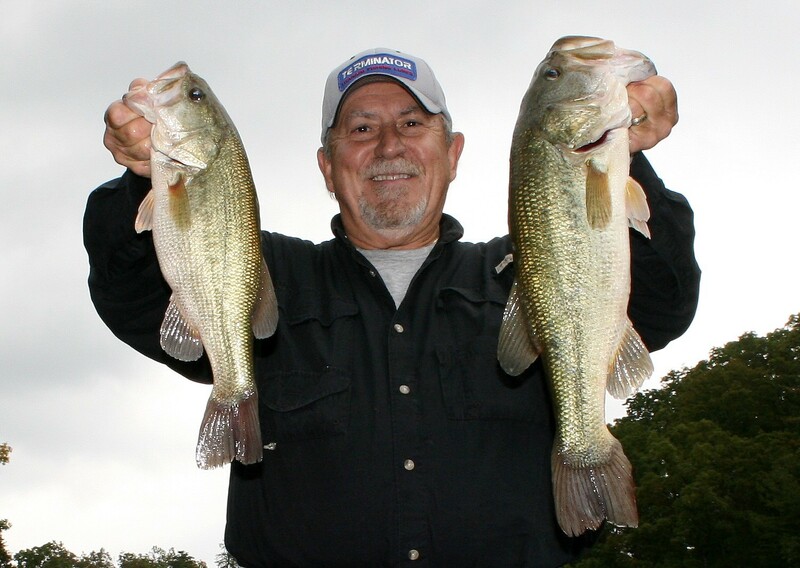 If you fill your deer tags early this year, I suggest you visit waters close to you that produce good bass fishing during summer and try this approach. 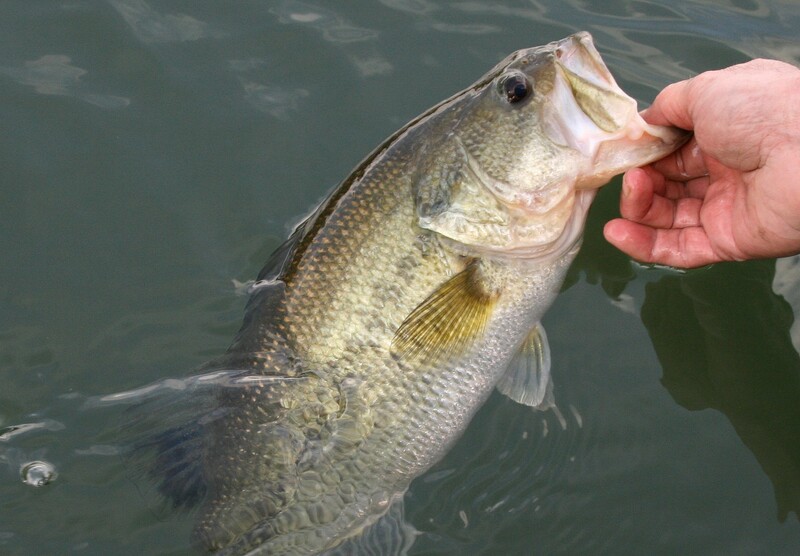 Choose days when conditions are most favorable, search for fish along steep transitions where deep water contacts the shallows, use the same lures and tackle I’ve described and you too can enjoy some good largemouth bass fishing away from the crowds. The fall period offers some of the best fishing of the year because most game fish feed heavily as day length decreases, many in shallow water where baitfish are attracted to cooling surface temperatures. However, finding good fishing is rarely that easy. Weather patterns, water temperature and condition are still important considerations when deciding when and where to fish. Ignore any of these factors and you may drive by great fishing on the way to a long day of poor results. The impact of weather on fish activity during fall is similar to that in spring, though the effect of high-pressure systems and accompanying lower temperatures is less intense because falling water temperatures won’t drop below the preferred range of most game fish until late in the season. Nonetheless, most shallow water feeding activity decreases with clearing skies so anglers must make adjustments in time-of-day, location and presentations to enjoy good fishing success as weather patterns change. I monitor barometric pressure to help me decide when and where to fish and what species I’ll fish for based on whether the barometer is rising, falling or stable. Stable or falling pressure often supports the best shallow-water fishing but changes in location and target species can keep you catching fish when the barometer is rising and skies are clear and blue. Fishing for largemouth bass moves to the top of my preference list this time of year. When surface temperatures begin falling and baitfish move shallow in October, I grab my tool box of largemouth lures and go to work. 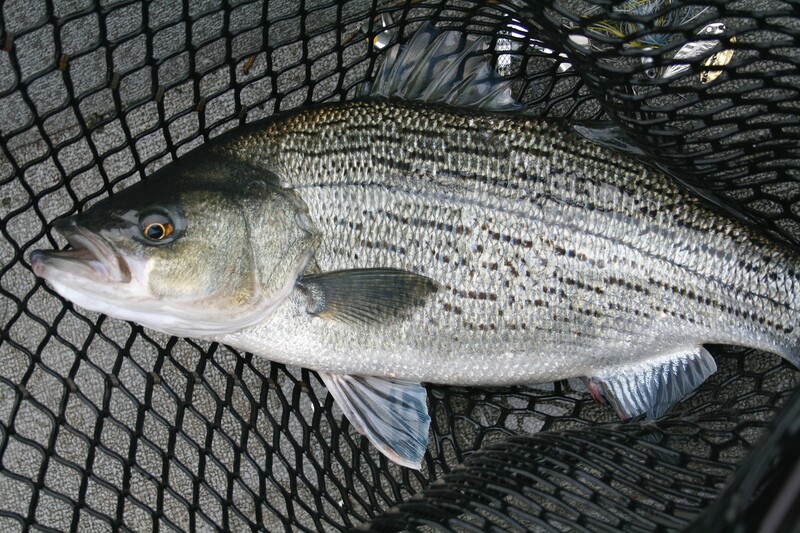 As water levels drop in reservoirs during fall, many bass move and feed closer to deep water along main-lake shorelines so shallow coves and smaller tributaries that produced good catches during spring often hold few fish. Because the best bass fishing occurs most around shallow structure, I have many lures that fish well through heavy cover so scattered floating leaves are little deterrent when choosing places to fish, though I avoid places where the surface is covered with mats of fallen leaves. In heavily fished waters, I use lures with natural finishes and actions like swimbaits, soft-plastic stickbaits and topwaters to fool educated fish conditioned by fishing pressure. Where floating leaves are present, I use weedless versions of these or similar lures. 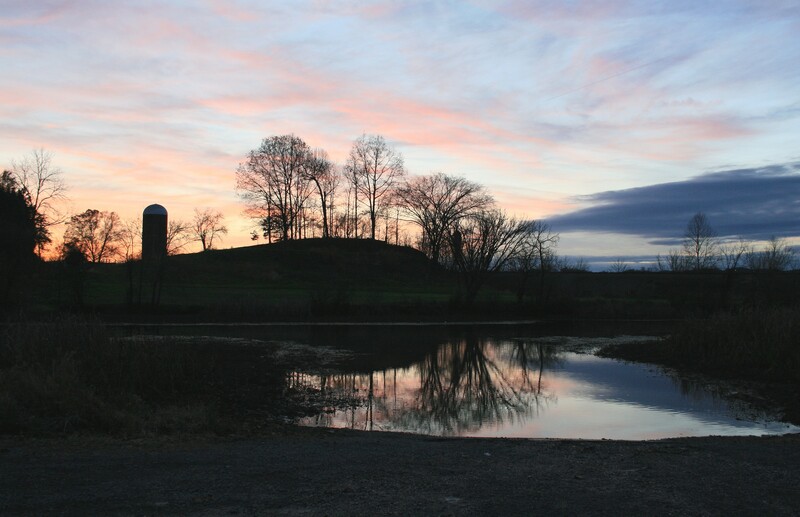 When deciding when to fish for largemouths, weather patterns must always be considered. Rising barometric pressure and bright clear skies offer poor conditions for largemouth fishing in shallow, open water anytime so I schedule my fishing time during periods when the barometer is falling or stable. Also, a major moon phase or lunar feeding period during time spent fishing for bass can make the difference between a good day and great day of fishing. Water temperature isn’t an important consideration for shallow-water largemouths during fall until surface temperatures begin dipping below about sixty degrees. Bass remain active and shallow in these and lower temperatures but deeper water and slower presentations begin to shine in cooler water. Also, as in spring, the colder the water the more likely the best fishing will occur in mid-afternoon when surface water temperature and the fish’s metabolism peaks. 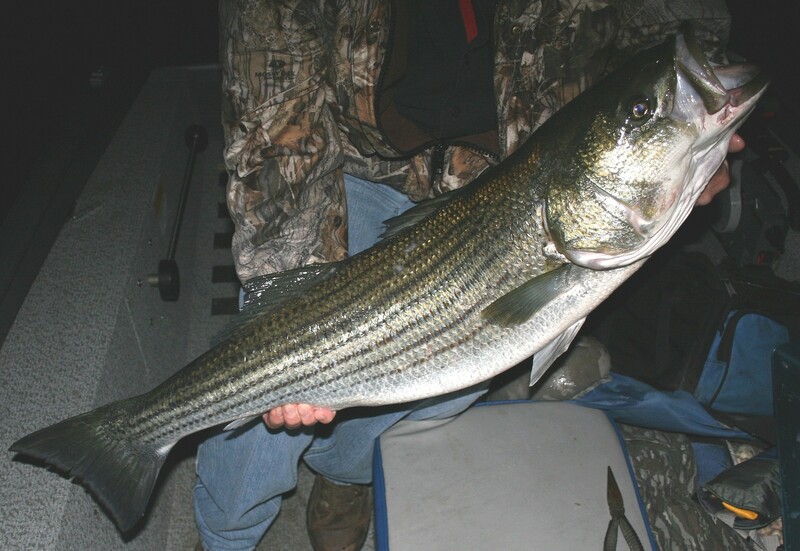 Hybrid striped bass are another favorite target species during fall, and for good reason. Catching big fish on topwater lures is an adrenaline-pumping experience and hybrids offer some of the most exciting topwater fishing of the year throughout the fall period. In reservoirs where they’re present, you can find hybrids in places that hold the highest concentrations of baitfish in mid-lake sections or where large tributaries join the main lake. Dense baitfish concentrations always attract schools of game fish so be prepared to cover water with your depth finder on until you find them. Feeding hybrids are voracious predators that often circle and drive baitfish against the water’s surface before attacking. When feeding begins, it’s hard to miss jumping baitfish as they try to escape the onslaught among the splashes of feeding predators. 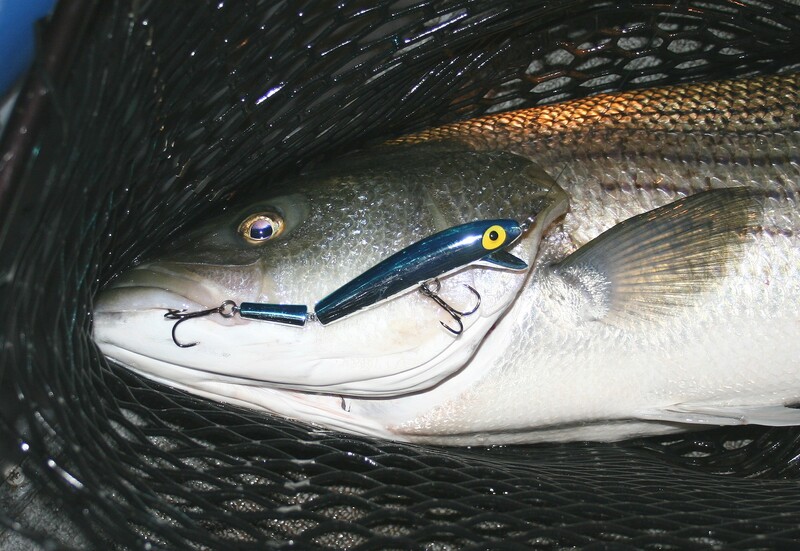 My first choice in lures for surfacing hybrids is a Super Pop R or other popping lure. Zara Spooks are another good choice and similar rubber-bodied weedless versions work well where the water’s surface is littered with leaves. When surface feeding stops, it’s hard to beat a 1/2-ounce rattling lure like a Rat-L-Trap with a chrome finish. You can cast these lures a mile, cover water at various depths and they’ll attract strikes from many species of shallow-feeding game fish. Hybrids have a tendency to stay close to the dinner table so unless conditions change they frequently stay in the same area for extended periods and often becoming predictable in their feeding habits. If you see them smashing baitfish between five and seven o’clock in the evening, be in the same spot the next day by four-thirty with fresh line, sharp hooks and high expectations because the same scenario is likely to repeat. But hybrids, like largemouths, respond negatively to weather changes that bring clearing skies and a rising barometer. When this weather pattern develops, you may find some surface activity but feeding usually shifts into deeper water with less intensity. So under stable weather, or when the barometer is falling, I prefer fishing in reservoirs with good populations of largemouth bass and hybrids during fall. 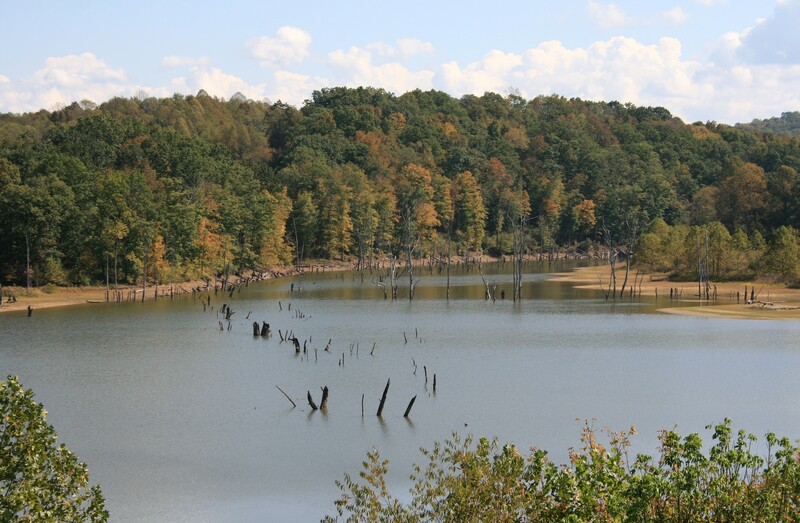 I choose lake sections with the highest concentrations of baitfish and cast to main-lake flats, points and fallen trees for bass while I watch for signs of surface feeding along the main river channel. Fish this setup under stable weather or an approaching front and you’ll often find good mixed-bag fishing for bass, hybrids and other shallow feeding predators. But as in spring, the arrival of cold fronts is common so high blue-bird skies, falling temperatures and rising pressure are frequent visitors. When this weather pattern arrives I shift from shallow-feeding predators in still water to those in moving water. 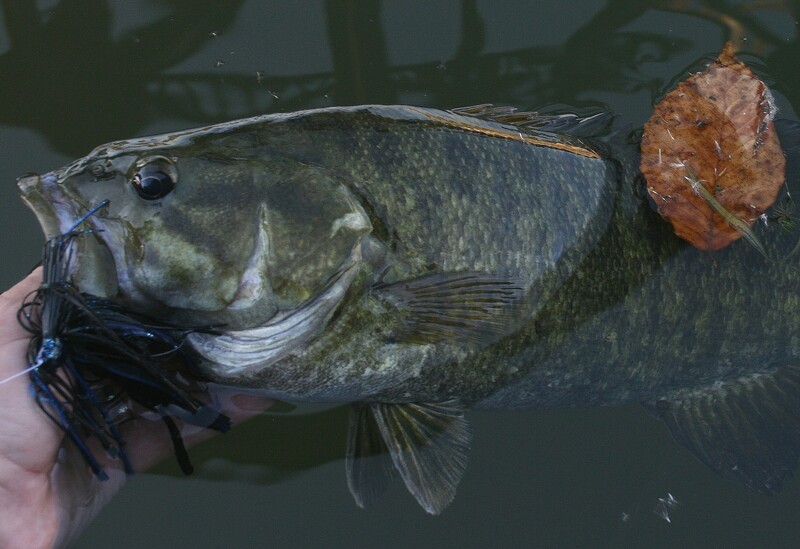 Smallmouth bass fishing in rivers is a good choice if you use lures weedless enough to fish through the plentiful fallen leaves and other floating vegetation. Leave lures with exposed hooks at home, pack your most reliable weedless soft plastics and you can enjoy good fishing for smallmouth bass in rivers throughout fall when water clarity is normal. However, when skies are clear and blue, I prefer to move to cleaner water in tail-waters where trout are plentiful and active. My good friend Andy Barnes caught this big tail-water brown under clear skies and a rising barometer soon after the sun fell below the horizon. 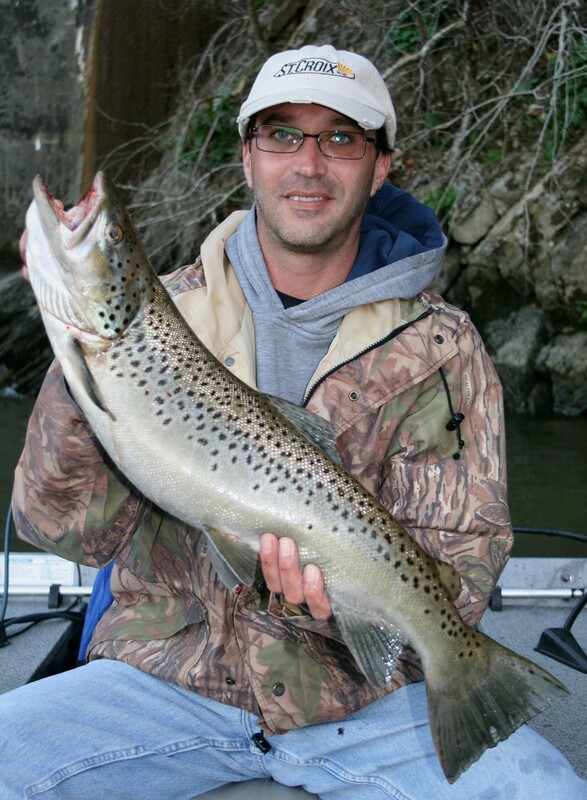 Trout fishing in tail-waters is a more reliable choice during cold-front conditions when most shallow water fishing is poor. Moving water negates some of the affect of clear skies and rising pressure and trout are less affected by clearing conditions because of their feeding habits. So when a high-pressure system moves in during fall, I start checking generation schedules below local dams to find the right combination of water flow and time of day. When generators are off or flow is lowest I fish for trout during low-light periods in early morning or the last few hours before dark. Under these conditions, thin low-visibility lines and small lures are the best choice in tackle and trolling is the best approach for covering water to find feeding fish. When generation is moderate to high, I move to swift water closer to the dam and cast to current edges with larger lures and heavier tackle. 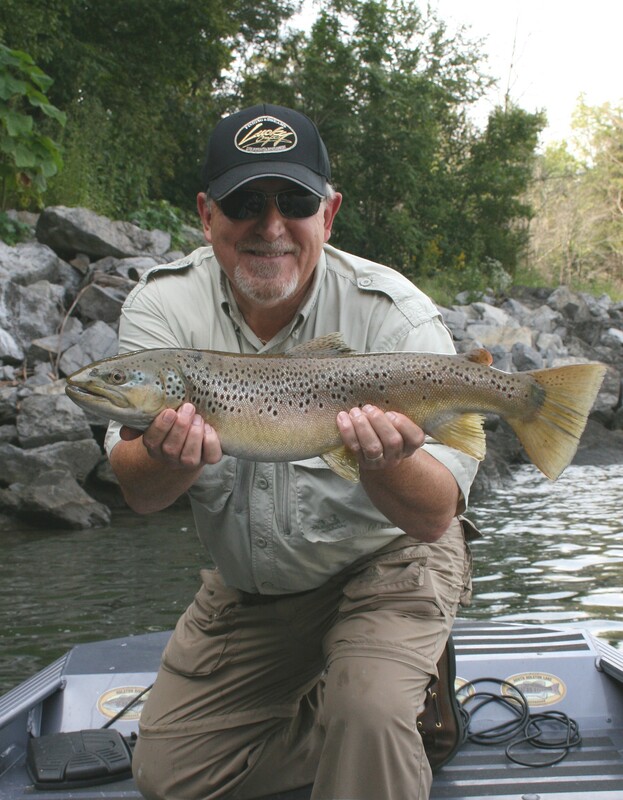 In high swift water rainbows and browns may feed all day under the clearest skies though periods of low light often produce the most and largest fish, especially big browns. Hard-bodied minnow lures in natural baitfish colors are top choices for tail-water trout throughout fall if you match lure size to the rate of flow. Smaller sizes fool feeding fish in slow current where visibility is best; larger sizes often run better in swift current and are easier for trout to see in turbulent water. 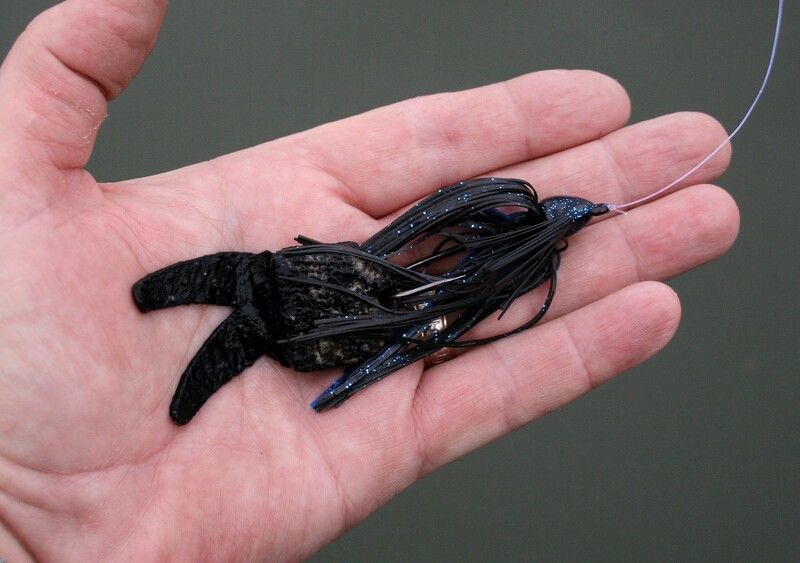 Where floating leaves are present, swimbaits rigged weedless in similar sizes and colors are good choices. Tail-water trout fishing remains good well into winter because these fish prefer a lower range of temperatures than most game fish. Then, as water temperatures continue to fall, tail-water trout become a more reliable choice for good fishing. So weather patterns, water temperature and condition are important factors to consider when deciding where and when to fish as well as which species to target. Make the correct decisions and adjustments in tackle and lure selection and you’ll catch more fish during this beautiful season of change. If you’d like to learn more about how I apply changing weather, water temperature and other environmental factors to my seasonal fishing game plan, pick up a copy of book and refer to Chapter 4: Peak Fishing Periods. With a basic understanding of how various fish react to changes in their environment, you’ll enjoy greater fishing success. It’s that time again. Day length is decreasing, surface water temperatures are falling, and baitfish are beginning to ring the surface on reservoirs across much of the country. Depending on where you live, great fall fishing may already be underway or about to explode. Once it begins, good shallow-water fishing will be with us until cold temperatures drive fish into deep water and all but the hardiest anglers to a warm recliner in front of a TV. If you’re not prepared, it’s time to get tackle in good operating condition, take an inventory and restock favorite lures in your toolbox. I fish often throughout the year so I put a lot of mileage on tackle and lose, break or strip the finish from many lures. Therefore, I service my tackle and lure inventory twice a year; during midwinter and again during late summer. If you’re a part-time angler, it’s still a good idea to do some midseason maintenance on tackle because inactive equipment may need attention as much as heavily used equipment. Depending on how you store your rods and reels, they may need some TLC worse than those heavily used but with good routine care and storage. You can quickly and easily provide adequate midseason service to any type of reel if you have the materials needed to do it and get organized before you start. Before removing anything lay out a lint-free cloth to hold parts in the order in which you remove them and set out a small screwdriver, wrench, toothbrush, cotton swabs, cleaning solution, oil and reel grease. If you intend to remove more than the handles and spool, it’s a good idea to find the schematic that came with your reel. The schematic will show each part inside the reel, where it goes and the order in which each is assembled. A schematic will also show how parts should be turned before reassembly including the slightest bends in otherwise uniform washers or spacers; an important thing to know because you can reverse a single crucial component in a reel and it won’t work properly. If you don’t have a schematic for your reel, you can find and download one free at Mike’s Reel Repair online. Mike’s also sells replacement parts if you need to replace something or buy an extra spool for your favorite spinning combo and they’ve always provided me with good customer service. To provide minimal service, take each reel off the rod, remove everything that can easily be removed such as handles and spools, spray them with WD40 or a good cleaning solution and wipe them clean of dust and grime. Use WD40 sparingly because it’s a degreaser, not a lubricant, so anything it touches will need fresh oil or grease. Use a toothbrush or other small brush to remove dirt and old lubricants; use cotton swabs for hard-to-reach spots being careful not to leave cotton fibers on moving parts. After external parts and casings have been well cleaned, apply a small amount of oil to all moving parts before reassembly. Unless the owner’s manual that came with your reel advises otherwise, apply oil to all moving parts and grease only to main gears. Apply grease to main gears with a finger tip or other handy tool and be sure the grease doesn’t contact adjoining parts. Where metal rubs metal or other material, apply a little oil. Many manufacturers offer good-quality lubricants and cleaning solutions for fishing reels. I use those made by Quantum and Ardent, who offers a full line of cleaning and lubricating supplies for reels. After cleaning spinning reels, apply a drop of oil to the spool shaft, any spacers or drag washers on the shaft, the line guide and rotor arm on either side of the bail, and the bearings through which the handle mounts; less is better if each part is adequately oiled. Place a couple drops of oil into the maintenance port, if the reel has one, and include any spare spools you use in the cleaning and lubrication process. After cleaning baitcasting reels, apply oil to the bearing under the handle, the case for casting brakes and all spacers and washers before reassembly. After reinstalling the handle, use a cotton swab or lint free cloth to clean the worm gear. Turn the reel handle to turn the gear and move the line guide while wiping the length of gear until it’s clean. And again, on moving parts and gears is not the place to leave cotton fibers or lint from an old rag. When the worm gear shines and looks clean, add a drop of oil to it and the levelwind shaft and turn the reel handle several times to spread oil along each; then wipe away the excess with a cotton swab or cloth. As you reassemble your cleaned and lubricated reels, check and tighten all external screws. Don’t over-tighten them but ensure each is snug. If you find one loose, remember to check it occasionally because it may need replaced. Follow these simple steps and you’ll be impressed with how much better your reels feel and operate. A more thorough cleaning should be done annually. If you’re not comfortable fully disassembling a reel for cleaning, many local tackle shops offer reel cleaning services at reasonable prices. Bass Pro Shops and a few others also offer mail-in services for reels including parts replacement and cleaning. Invest a little time and money once a year and you can get many years of good, problem-free service from most mid- to upper-priced reels. While the cleaning supplies are out is a good time to clean and inspect rods. I spray each rod blank with WD40, wipe it clean, then check and clean each line guide individually. After cleaning, run a clean cotton swab around the surface of each guide to check for cracks or wear from braided lines and carefully straighten those that are slightly bent. I also touch up darkened cork handles by holding them under running water and lightly scrubbing them with a steel-wool soap pad. My brother-in-law, the musky hunter, likes his rod handles dirty; “Gives them character”, he grumbles. Whichever look you prefer, it only takes a few minutes to make old cork look like new. The final step in getting tackle ready is replacing lines on reels. I change monofilament often because of line memory, a leading cause of poor line performance and reduced casting distance. And monofilament is inexpensive so when I know fishing is about to get hot, I always spool up with fresh line. However, before replacing it I consider what type fishing I’m going to do. For fishing shallow cover, I choose heavier, abrasion resistant line; for chasing schooling fish in open water, I use thin-diameter, limper lines that support greater casting distance. Fluorescent lines are good choices for high-speed search baits, where line color is less noticeable, or when fishing along bottom with slow-moving baits where line watching is important. Clear monofilament, even fluorocarbon, is a better choice for medium retrieve speeds in clear water. So choose a line that matches best with the type fishing you plan to do then replace enough for a long cast plus a respectable amount of backing and a single replacement spool of monofilament will keep you in fresh line the rest of the year. I recycle most braided lines because they have low or no memory and are expensive to replace. To replace worn, discolored braid, I tie a bright rubber band or other object to the end of the line and walk in well-spaced loops around my yard as I feed line until all has been removed. Then I cut the line, walk back to the rubber band and blood-knot the used portion to the backing left on the reel. If the spool wasn’t full, I add more backing to insure the spool is properly filled after respooling. When finished, I have like-new braided line on the business end of the spool and I’m ready for the toughest fish. I often replace my most dependable lures well before the fall bonanza but am especially attentive of hook condition on those that remain in my toolbox. I do a thorough inspection of hooks on all my lures and sharpen or replace them if they’re dull or bent so my most common expenditure during restocking is for replacement hooks. I may do a little touch-up on lure finishes with fingernail polish or jig paint but rarely replace them unless they’re proven favorites and mangled beyond use. But hooks are the single piece of equipment that connects me directly to fish so I don’t compromise on quality and always choose the best-of-the-best available, mostly chemically sharpened models. And because the fall period offers great shallow-water fishing, it’s a good time to try new lures or new colors of old favorites. When fish are biting well is the best time to experiment with new things. It takes discipline to test new lures or methods of presentation when fish are biting well but there isn’t a better time to learn new ways to catch fish. So get your tackle ready, restock on old favorites and grab a few new products you’ve been dying to try. 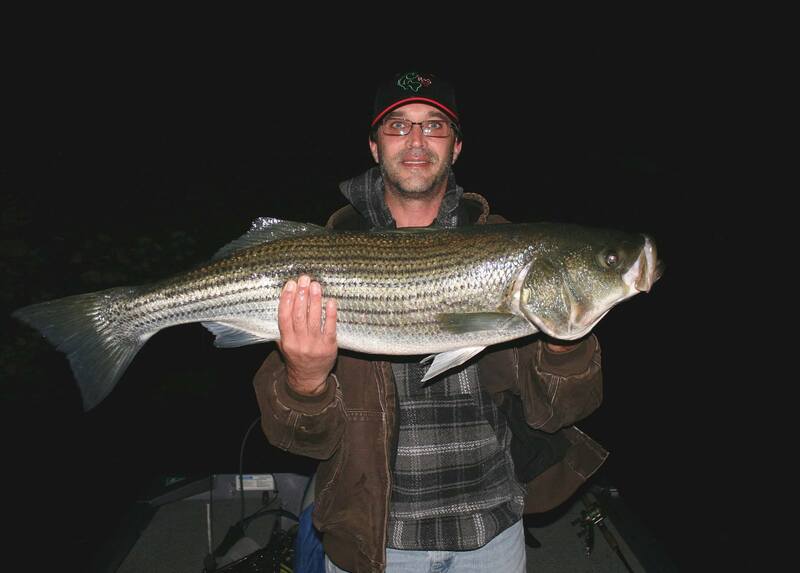 Great fall fishing is upon us and it’s time to go catch our share!